This page is for the original game. For the re-release, see Age of Empires II HD. Base game does not work on Windows 10 due to SafeDisc support being discontinued (UserPatch: Conquerors Feature Update fixes this issue for The Conquerors). UserPatch: Conquerors Feature Update adds support for widescreen/multi-monitor resolutions. Demos are available for The Age of Kings and The Conquerors Expansion. No-CD patches are already applied; the DVD is only necessary for installation - which ensures compatibility with modern operating systems; and all games are fully patched to their latest versions. However, it should be noted that the DVD re-release of these games does not feature the Red Book audio stored as separate audio tracks on the original games' discs. As such, the game music will not be played while the DVD is in the drive. Windows version is sold separately, Mac OS version only in Gold Edition. The latest patch for the base game is Version 2.0a. The latest patch for The Conquerors is Version 1.0c. The unofficial patch for Conquerors, which includes NoCD is Version 1.0e. The unofficial UserPatch: Conquerors Feature Update patch for The Conquerors adds many fixes including widescreen support, UPnP port forwarding, and various optional tweaks. Although it doesn't include a NoCD, it will not remove a valid NoCD. If it is installed on top of Version 1.0e, no CD is required. 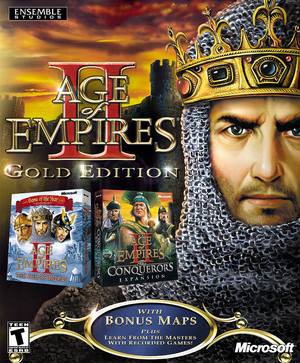 Age of Empires II: Forgotten Empires is an unofficial expansion which adds new civilizations, maps and other fixes. Adds Online Matchmaking and automatic UserPatch installation. Install UserPatch: Conquerors Feature Update. Install UserPatch: Conquerors Feature Update. 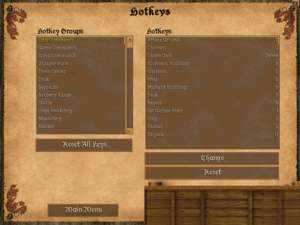 Uncheck "widescreen interface style" to centre minimap and unit controls. Install UserPatch: Conquerors Feature Update. Select Windowed mode support, then select a resolution lower than your desktop resolution. Menus will be windowed 4:3. Install UserPatch: Conquerors Feature Update. Select Windowed mode support, then set the in-game resolution to your desktop resolution. On some older Dell laptop models (e.g. the M1530) an issue occurs where the OS crashes and a blue-screen of death is displayed. This issue occurs after a seemingly random amount of gameplay time (from <30 seconds to 10 or 20 minutes). Many things have been tried to fix the issue including changing graphics card drivers, limiting the frame rate to mitigate overheating and running on virtual machines of different operating systems (e.g. Windows 98). As far as can be seen, this issue has never been resolved nor will it be, rendering AoE2 unplayable on the affected models of laptop. This issue can be mitigated by playing through Voobly.com game client and selecting 32-bit DirectX mode in the lobby options. It is actually caused by an unterminated loop in the graphics card driver. However, Age of Empires II HD (the re-mastered version of the game released in 2013) is unaffected by this problem. Install UserPatch: Conquerors Feature Update to fix this for The Conquerors (this does not fix the issue for the base game). 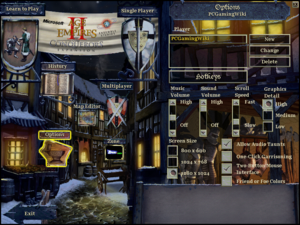 Windows Vista and 7 can have issues with displaying true colours in Age of Empires II correctly. This issue does not occur on Windows 8 and later. See rainbow color problems in older games for further details. Install UserPatch: Conquerors Feature Update. This includes a color fix for Vista and 7, and will also set a registry flag, allowing Windows 8+ to emulate the 256-colour modes, required by the game. It will also optionally provide support for loading the windowed mode plugin, which, apart from its direct purpose, also performs software palette conversion to 32-bit, resolving said issues. Use DirectDrawFix to apply the required compatibility fixes to the registry. This method allows gaming over LAN on modern versions of Windows. Right-click on the LAN adapter and open "Properties". Highlight "Internet Protocol Version 4 (TCP/IPv4)" and click on "Properties". Check "Use the following IP address:" and enter an address which is not currently being used on your network (such as 192.168.1. [1-253] e.g. 192.168.1.11 ). Also change the Subnet mask to 255.255.255.0 and leave the default gateway blank. While in use, internet connection will be lost until the settings are switched back to "Obtain an IP address automatically", but LAN will function in-game. Download the demo version of Age of Empires II. Copy the midi folder from the sound folder of the demo of AOEII. Paste the folder in the sound folder of the full game. Run the game with the -midimusic command line argument. Music from the Conquerors expansion demo can also be used; rename the Conquerors MIDI files from music 1-8 to 9-16 to prevent replacement of existing files. The -midimusic parameter is no longer supported in UserPatch, however its m3u playlist system allows any audio format to be used for in-game music, including WAV, MP3, WMA, AAC, and FLAC, as long as the required DirectShow codecs are installed. This page was last edited on 10 April 2019, at 04:43.